Natural Pets TV is an ongoing series of YouTube videos from Pet World Insider dedicated to promoting the best health of our canine feline companions. 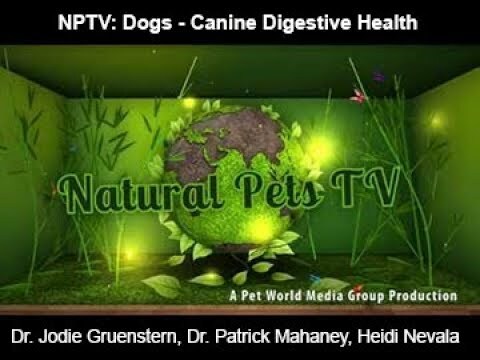 This episode, Dog Edition- Canine Digestive Issues, features Pet World Insider’s Robert Semrow, Natura Petz Organics’ Heidi Nevala, Dr. Jodie Gruenstern , and I covering causes, treatments, and prevention of canine digestive problems. Considering we are well in the winter holiday season when there are more tempting human foods involved in our celebrations, dogs are more-prone to dietary indiscretion (eating things they should not) or being fed tasty treats which their bodies may not be used to digesting. As a result, dogs can exhibit digestive tract upset like vomit, diarrhea, decreased appetite, and other clinical signs.